As mentioned elsewhere, we've locked off additional sales of the game on all platforms until launch. If you previously purchased the game on itch.io, you're eligible to claim a Steam key. 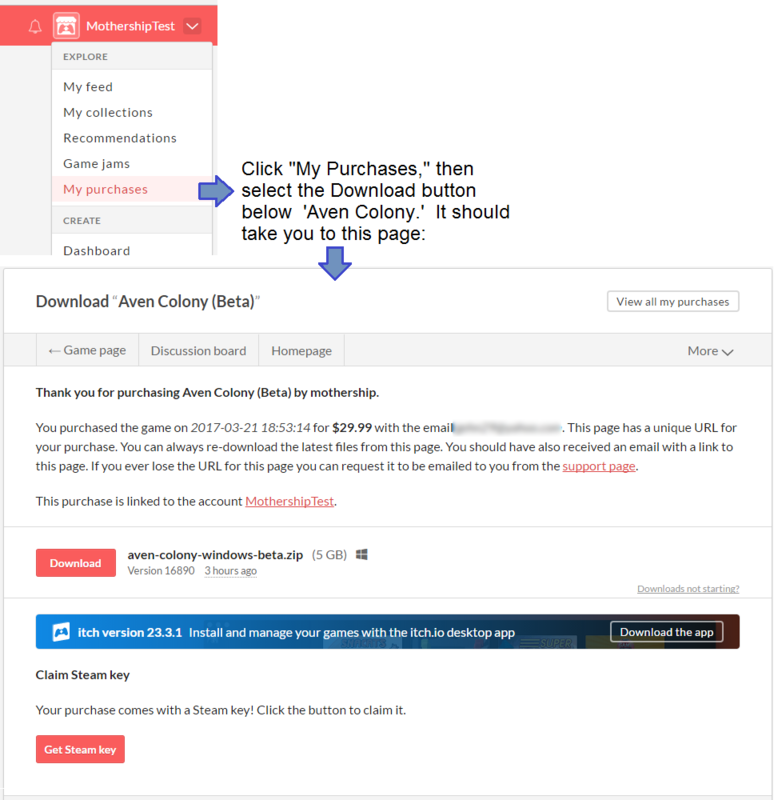 Log in to itch.io's website ( https://itch.io/ ) using the same account that you used to purchase AvenColony. Click on the account drop-down in the upper-right and click "My Purchases"
On the Download page, press "Get Steam key"
Once you've installed the game on Steam, you can find instructions here for copying over your saved game files. Steam has no game called Aven Colony, yet you say claim my Steam Key, WTF. It's not on the Steam Store yet. But it IS available directly through Steam to those who bought it through itch.io. You should add that the person need to go to "Games-> activate a product on Steam" in Steam and then enter the code there. Was there a time limit for claiming the key? When I try to do this now the link I get in the email just sends me tot a 404 page. i'm getting the dame 404 message, is there anyway to get around this?